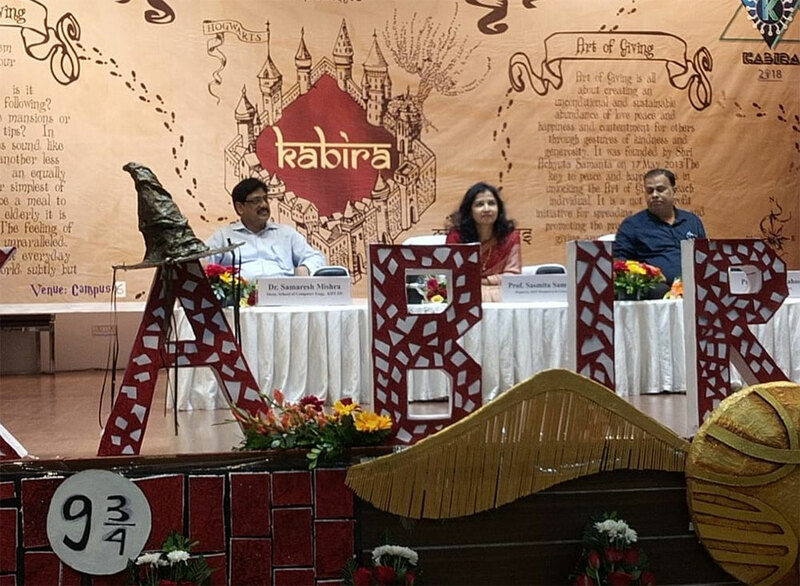 ‘KABIRA-2K18′, the Fresher’s Welcome function of B. Tech Computer Science and Engineering program was held on 10thOctober, 2018 at Campous-6 auditorium. Based on the theme “Greatness in Giving”, the gala event was attended by enthusiastic students of 1st and 2nd year along with the invited guests, faculty & staff members of the school. The function was graced by Prof. Sasmita Samanta, Registrar of KIIT DU; Prof. Biswajit Sahoo, Director-Student Affairs and Prof. Samaresh Mishra Dean, School of Computer Engineering. Prof. Sasmita Samanta stressed upon innovation and entrepreneurship skill among the students for the development of the society and the economy of the country rather than simply becoming job seekers. Prof. Biswajit Sahoo emphasized on the needs of technical know-how of students in order to compete with global education and requirements. Prof. Samaresh Mishra welcomed the students by chipping in the strength of university academic process, research, achievements, involvements and process of translation of skilled persons to strategic decision makers.